The ethical conundrum of how A.I.-powered machines should act in life-or-death situations has received more scrutiny as driverless cars become a reality, but the car manufacturer believes that it’s safer to save the life you have greater control over. "You could sacrifice the car. You could, but then the people you’ve saved initially, you don’t know what happens to them after that in situations that are often very complex, so you save the ones you know you can save", Christoph von Hugo, Mercedes’ manager of driver assistance systems, told Car and Driver. "If you know you can save at least one person, at least save that one. Save the one in the car". "This moral question of whom to save: 99% of our engineering work is to prevent these situations from happening at all", Hugo said. "We are working so our cars don’t drive into situations where that could happen and [will] drive away from potential situations where those decisions have to be made". 3) the manufacturer is always liable. As these rules are fleshed out, German officials could be forced to clarify whether manufacturers are allowed to prioritize the driver. It must be also noted that in Germany, it is illegal to reduce human life to a value that is processed by some cost function of an algorithm. 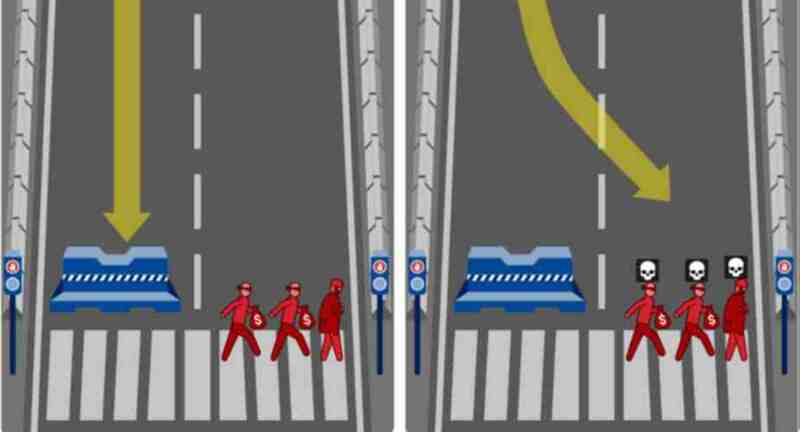 This means a driverless car which is going to crash and (potentially) kill two people, being only one person on the car, it is illegal that any algorithm decides that it is better to kill one person than two people. On these grounds, Volvo already announced months ago that they will accept liability for self-driving car crashes. Finally, a recent academic research found that people were in favour of minimizing trauma in general, but for maximizing vehicle occupant safety if they, themselves, were the occupant.